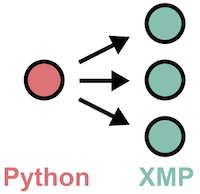 This page explains how to call an XMP program from Python program. 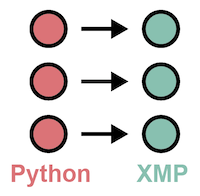 The method of calling a Python program from the XMP program is the same as calling a Python program from each base language. We provide two ways to call an XMP program as follows. Calling the XMP program from a Python program which is running in parallel by the mpi4py package. The number of parallel in the XMP program is the same as the number of parallel in the origin Python program. In line 1 of the Python program, XMP package is imported. In line 4, the shared library is specified which is created by the XMP program with the function you want to call. In line 6, the XMP program is called. The first argument of xmp.call() is an MPI communicator, which is used to generate the node set in the XMP program. The second argument is the function name of the XMP program. The third argument is an argument to be passed to the function of the XMP program. If the argument of the XMP program function is unnecessary, the third argument of xmp.call() can be omitted. Call the parallel XMP program from the sequential Python program. The first argument of xmp.spawn() is the number of nodes of the XMP program. The second argument is the function name. The third argument is an argument to be passed to the function of the XMP program. If the argument of the XMP program function is unnecessary, the third argument of xmp.spawn() can be omitted. xmp.spawn() waits until the specified XMP program is completed, but if you do not want to wait for completion of XMP, specify async as shown below. xmp.wait() guarantees completion of the XMP program.